Located right next to Pathumwan Princess Hotel, an enormous marble mall since 1985, at 8-storeys high and 330 metres long it is one of the bigest malls in Asia. This mall covers products and services that satisfy everyone's needs ranging from clothes, cosmetics, leathered items, jewellery, electronics, information technology needs, furniture, restaurants and many others. Siam Square is and outdoor cluster of shops, filled up with independent clothing designers, music stores and other things of interest to the younger crowd. 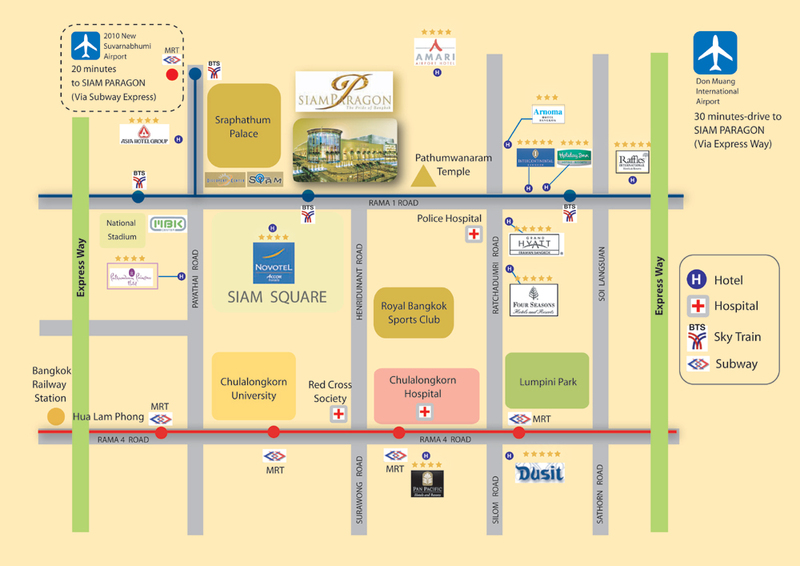 Or alternatively you can shop indoor at Siam Centre & Siam Discovery. Another shopping centre is currently under construction, called Siam Paragon. Shopping is a pleasure when a major mall is right next door under the same roof. The Central Plaza Complex houses one of the central deartment Stores, Thailand's leading upmarket retail outlet amongst countless boutiques, shops and mini cinema theatres. A typical modern shopping centre offers famous branded products on Sukhumvit Soi 24 near Prompong skytrain station. Full of designer collections, department stores, restaurants, coffee shops, fast food, supermarket and a multi-screen cinema on the 6th floor. This is one of Bangkok's most popular night bazaars near the red light district on Silom road. Beginning around 7pm every day, stalls by the sidewalks of Silom road sell clothing, trinkets, music, sundry, souvenirs and anything one could imagine. This enormous market is only open on Saturday and Sunday. You can find almost everything from pets and plants to clothes and antiques. The market is open-air, though covered, and can be incredibly hot on even a mild day. The market is very well organized into sections for clothing, pets, furniture, etc. An outdoor wholesaler market right near Indra Regent, minutes walk from D'Ma Pavilion and Amari Watergate. Opens daily from 8am-6pm, it gets very crowded but has great deals on cheap clothing. Get ready to blend in with the local Thai and sharpen up your bargaining skills. Located in front of the Grand Hyatt Erawan Hotel, this enchantingly famous and highly revered shrine was erected in 1956. Visitors, both Buddhist and non-Buddhists alike, cannot help but appreciate the beauty and significance this omnipotent deity brings to the district. It is written that Lord Brahma is able to oversee and protect over the mortal and immortal worlds with his four faces that symbolize all four directions facing North, East, South, and West. This shrine attracts thousands of people each year as it is believed that Lord Brahma has the ability to answer prayers and fulfill wishes for his faithful visitors. elephants as Lord Erawan, god of Elephants, was his celestial vehicle.